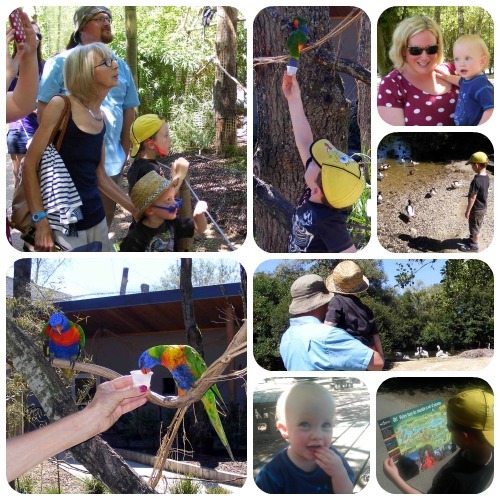 Parc Oiseaux is more than just a bird park, it's the size of a ZOO! If you are ever in the Ain region of France I strongly suggest you check it out. We were there most of the day and didn't get to see everything, or take in the shows, feedings, or even the train ride. The kids want to go again next time we visit my Dad. The enclosures are huge, the animals very well looked after, and there are play areas and cafes and toilets dotted around. Jack loved seeing the parrots and got to feed these beautifully coloured little birds. Tom got the chance to feed them but was a little too shy to actually do it. George refused to be held and wriggled free of our arms to potter about and take a closer look at them, getting as close as he could - which was very very close since they were soooo tame! It was a perfect day out for them!